Shanganagh Cliffs, Shankill - 11th June 2017. South Dublin members on the Shanganagh outing gather in Shankill DART station car park. Picture by Brian Miles. 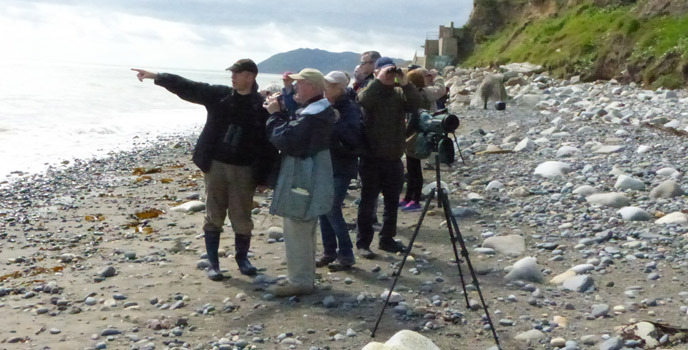 A June outing to the Sand Martin colony at Shanganagh Cliffs has become a regular fixture in the South Dublin branch calendar. 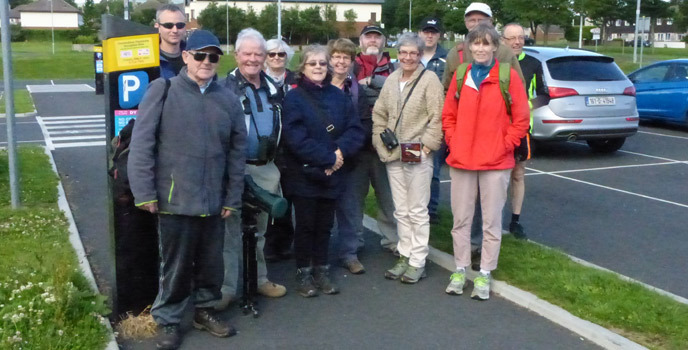 This year's visit attracted about 30 members who assembled in Shankill DART station car park for 10:30, where they were welcomed by Frank Doyle, our Chairman, who then handed over to Niall Hatch, who led the outing. 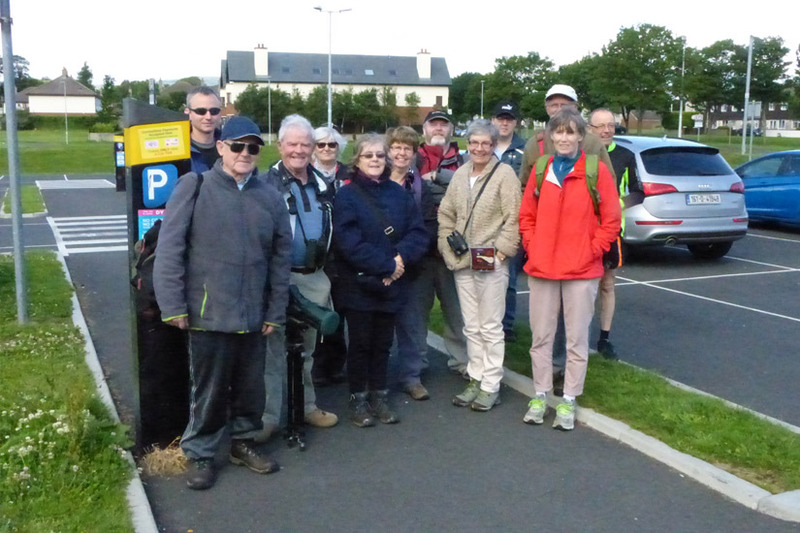 We departed the car park and headed down Corbawn Lane to the beach area at Shanganagh Cliffs. 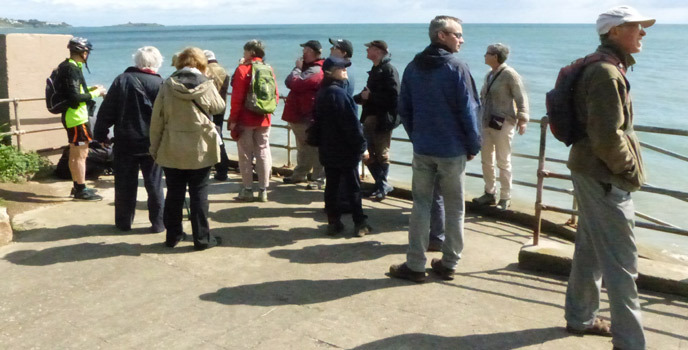 On arrival we were immediately aware of the very many Sand Martins actively flycatching over the cliffs, along the beach and even out to sea. All of the birds we observed were adults, meaning this year's chicks were still in their burrows and not yet fledged. They seemed totally indifferent to our presence as we proceeded along the stony beach to gather opposite an area of cliff favoured by these birds where we could enjoy the spectacle. Sand Martin out hunting flying insects at Shanganagh Beach. Picture by Billy Quinn. 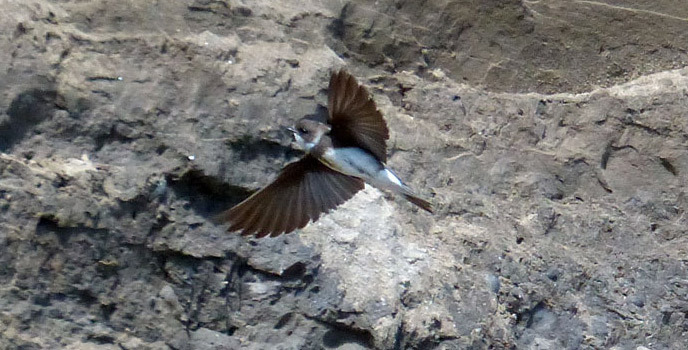 Sand Martin has a world wide distribution found in both the Old and New Worlds, breeding across much of Europe, North America and Asia. It is a highly migratory swallow, spending the winter in Africa, South America, India and southeast Asia. Irish birds winter in Africa south of the Sahara. For nesting it relies on the availability of vertical sand or mud banks, cliffs etc., where they can dig their burrows. They are the first of the hirundines to arrive back, with some appearing as early as March, well ahead of House Martin and Swallow. 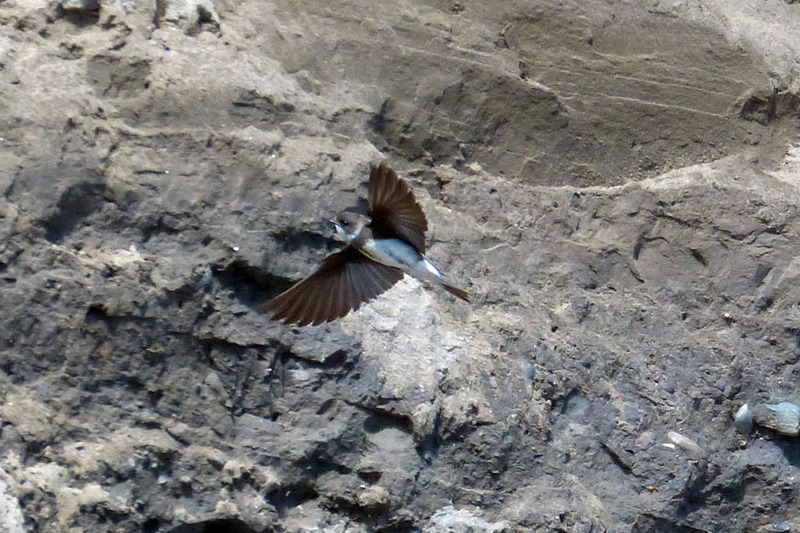 Sand Martins are very colonial, with nest burrows often packed close together down to a few feet apart. Irish birds are single brooded typically laying between three and six eggs. The young birds are similar in appearance to adults but can be separated by pale tips to the wing and tail feathers and a somewhat less defined breast band. In 2014 Dave Bird kindly wrote an informative note for the branch entitled 'A Closer Look at Swift, Sand Martin, House Martin and Swallow' that may be accessed through the NOTES page of this website. Niall pointing out some distant Gannets to Frank. Picture by Brian Miles. It wasn't all about Sand Martins on the day, other birds were showing well also. Some House Sparrows were spotted on the cliffs, including a fine looking male that was displaying. Out to sea were Gannets, Herring Gulls, Great Black Backed Gulls and Cormorants as well as some very distant Manx Shearwaters. Several Sandwich Terns were feeding close to the shore, diving for fish. As they came closer their harsh 'kear-ik, kear-ik' calls could be clearly heard. Niall pointed out that although they plunge in the sea to catch their prey, they are unable to swim and must take off immediately or perish. Butterflies seen were a couple of Speckled Wood, Holly Blue and one of the white butterflies. A Grey Seal popped its head up and checked us out but soon lost interest and departed. 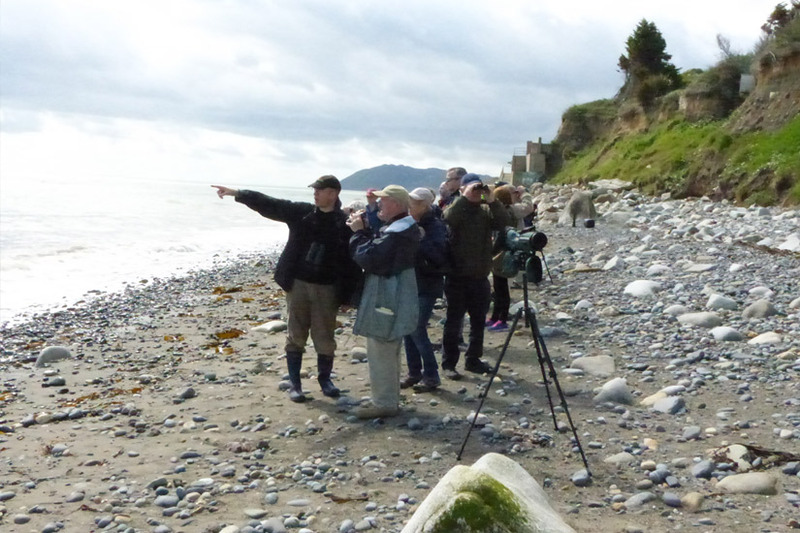 South Dublin members retreat to higher ground to avoid the incoming tide. Picture by Brian Miles. We had arrived during an incoming spring tide and by noon the old saying 'time and tide waits for no man' became very relevant as the waves were reaching further and further up the shore, all the time getting closer and closer to blocking our exit. So we departed the beach and regrouped at the top of the steps leading to beach where we continued our outing until about 12:30 when we called it a day. 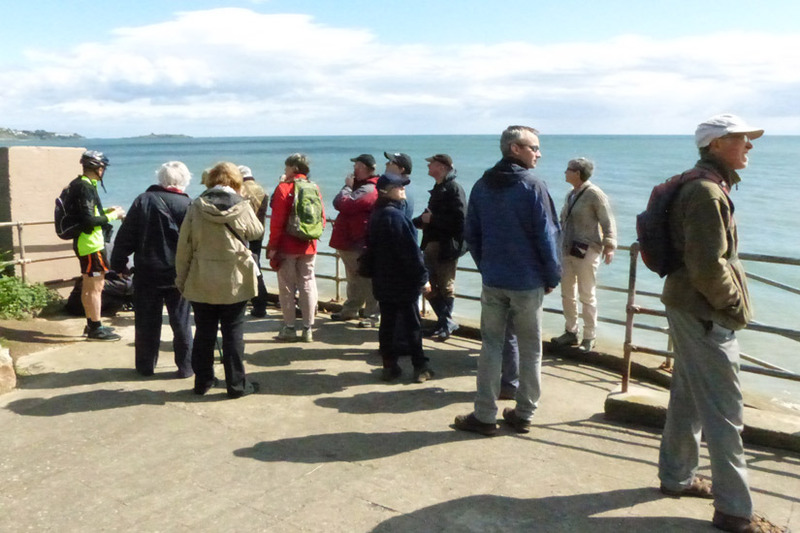 Despite a forecast of passing rain showers, the morning had remained dry with partly cloudy skies and just a gentle onshore breeze, and all present agreed it was an enjoyable outing and a great way to finish off our 2016-17 season.